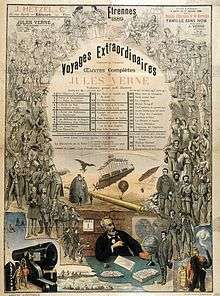 Jules Gabriel Verne (/vɜːrn/; French: [ʒyl vɛʁn]; 8 February 1828 – 24 March 1905) was a French novelist, poet, and playwright best known for his adventure novels and his profound influence on the literary genre of science fiction. Verne was born to bourgeois parents in the seaport of Nantes, where he was trained to follow in his father's footsteps as a lawyer, but quit the profession early in life to write for magazines and the stage. 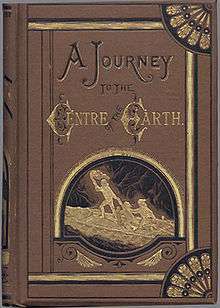 His collaboration with the publisher Pierre-Jules Hetzel led to the creation of the Voyages extraordinaires, a widely popular series of scrupulously researched adventure novels including Journey to the Center of the Earth (1864), Twenty Thousand Leagues Under the Sea (1870), and Around the World in Eighty Days (1873). 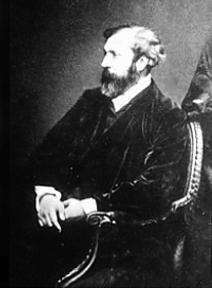 Jules Gabriel Verne was born on 8 February 1828 on Île Feydeau, a small artificial island on the Loire River within the town of Nantes, in No. 4 Rue de Clisson, the house of his maternal grandmother Dame Sophie Allotte de la Fuÿe. His parents were Pierre Verne, an attorney originally from Provins, and Sophie Allote de la Fuÿe, a Nantes woman from a local family of navigators and shipowners, of distant Scottish descent. [lower-alpha 1] In 1829, the Verne family moved some hundred meters away to No. 2 Quai Jean-Bart, where Verne's brother Paul was born the same year. Three sisters, Anna (1836), Mathilde (1839), and Marie (1842), would follow. Legend has it that in 1839, at the age of 11, Verne secretly procured a spot as cabin boy on the three-mast ship Coralie, with the intention of traveling to the Indies and bringing back a coral necklace for his cousin Caroline. The ship was due to set out for the Indies that evening but stopped first at Paimboeuf, where Pierre Verne arrived just in time to catch his son and make him promise to travel "only in his imagination". It is now known that the legend is an exaggerated tale invented by Verne's first biographer, his niece Marguerite Allotte de la Füye, though it may have been inspired by a real incident. In 1840, the Vernes moved again to a large apartment at No. 6 Rue Jean-Jacques-Rousseau, where the family's youngest child, Marie, was born in 1842. In the same year Verne entered another religious school, the Petit Séminaire de Saint-Donatien, as a lay student. His unfinished novel Un prêtre en 1839 (A Priest in 1839), written in his teens and the earliest of his prose works to survive, describes the seminary in disparaging terms. 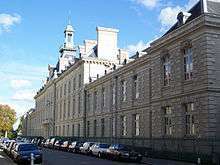 From 1844 to 1846, Verne and his brother were enrolled in the Lycée Royal (now the Lycée Georges-Clemenceau in Nantes). After finishing classes in rhetoric and philosophy, he took the baccalauréat at Rennes and received the grade "Fairly good" on 29 July 1846. 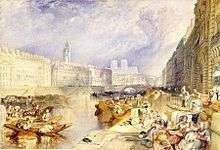 In 1847, Verne's father sent him to Paris, primarily to begin his studies in law school, and secondarily (according to family legend) to distance him temporarily from Nantes. 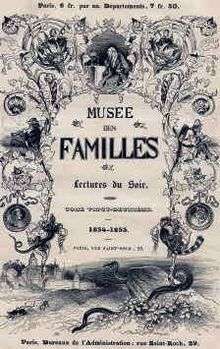 His cousin Caroline, with whom he was in love, was married on 27 April 1847 to Émile Dezaunay, a man of 40, with whom she would have five children. Verne arrived in Paris during a time of political upheaval: the French Revolution of 1848. 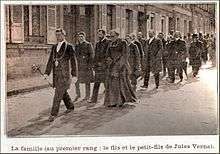 In February, Louis Philippe I had been overthrown and had fled; on 24 February a provisional government of the French Second Republic took power, but political demonstrations continued, and social tension remained. In June, barricades went up in Paris, and the government sent Louis-Eugène Cavaignac to crush the insurrection. Verne entered the city shortly before the election of Louis-Napoléon Bonaparte as the first president of the Republic, a state of affairs that would last until the French coup of 1851, in which Bonaparte had himself crowned ruler of the Second French Empire. In a letter to his family, Verne described the bombarded state of the city after the recent June Days Uprising but assured them that the anniversary of Bastille Day had gone by without any significant conflict. In July 1858, Verne and Aristide Hignard seized an opportunity offered by Hignard's brother: a sea voyage, at no charge, from Bordeaux to Liverpool and Scotland. The journey, Verne's first trip outside France, deeply impressed him, and upon his return to Paris he fictionalized his recollections to form the backbone of a semi-autobiographical novel, Backwards to Britain (written in the fall and winter of 1859–1860 and not published until 1989). A second complementary voyage in 1861 took Hignard and Verne to Stockholm, from where they traveled to Christiania and through Telemark. 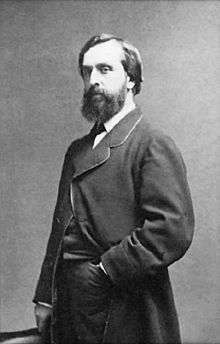 Verne left Hignard in Denmark to return in haste to Paris, but missed the birth on 3 August 1861 of his only biological son, Michel. In 1867, Verne bought a small ship, the Saint-Michel, which he successively replaced with the Saint-Michel II and the Saint-Michel III as his financial situation improved. On board the Saint-Michel III, he sailed around Europe. In 1870, he was appointed as "Chevalier" (Knight) of the Légion d'honneur. 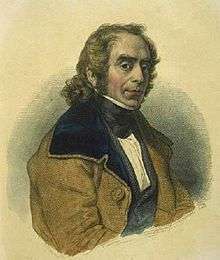 After his first novel, most of his stories were first serialised in the Magazine d'Éducation et de Récréation, a Hetzel biweekly publication, before being published in book form. His brother Paul contributed to 40th French climbing of the Mont-Blanc and a collection of short stories – Doctor Ox – in 1874. Verne became wealthy and famous. On 9 March 1886, as Verne was coming home, his twenty-five-year-old nephew, Gaston, shot at him twice with a pistol. The first bullet missed, but the second one entered Verne's left leg, giving him a permanent limp that could not be overcome. This incident was hushed up in the media, but Gaston spent the rest of his life in a mental asylum. 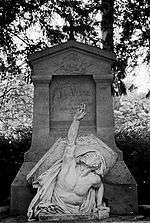 This denial of formal literary status took various forms, including dismissive criticism by such writers as Émile Zola and the lack of nomination to Verne for membership in the Académie Française, and was far from unrecognized by Verne himself, who said in a late interview: "The great regret of my life is that I have never taken any place in French literature." To Verne, who considered himself "a man of letters and an artist, living in the pursuit of the ideal", this critical dismissal on the basis of literary ideology could only be seen as the ultimate snub. These contemporaneous English-language translations have been widely criticized for their extensive textual omissions, errors, and alterations, and are not considered adequate representations of Verne's actual novels. 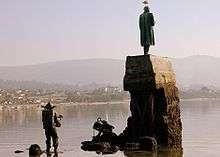 The British writer Adam Roberts, in an essay for The Guardian titled "Jules Verne deserves a better translation service", commented: "I'd always liked reading Jules Verne and I've read most of his novels; but it wasn't until recently that I really understood I hadn't been reading Jules Verne at all.... It's a bizarre situation for a world-famous writer to be in. Indeed, I can't think of a major writer who has been so poorly served by translation." The relationship between Verne's Voyages extraordinaires and the literary genre science fiction is a complex one. Verne, like H. G. Wells, is frequently cited as one of the founders of the genre, and his profound influence on its development is indisputable; however, many earlier writers, such as Lucian of Samosata and Mary Shelley, have also been cited as creators of science fiction, an unavoidable ambiguity arising from the vague definition and history of the genre. Closely related to Verne's science-fiction reputation is the often-repeated claim that he is a "prophet" of scientific progress, and that many of his novels involve elements of technology that were fantastic for his day but later became commonplace. These claims have a long history, especially in America, but the modern scholarly consensus is that such claims of prophecy are heavily exaggerated. As with science fiction, Verne himself flatly denied that he was a futuristic prophet, saying that any connection between scientific developments and his work was "mere coincidence" and attributing his indisputable scientific accuracy to his extensive research: "even before I began writing stories, I always took numerous notes out of every book, newspaper, magazine, or scientific report that I came across." 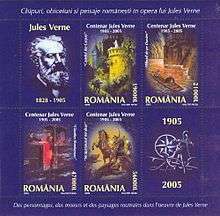 Verne's novels have had a wide influence on both literary and scientific works; writers known to have been influenced by Verne include Marcel Aymé, Roland Barthes, René Barjavel, Michel Butor, Blaise Cendrars, Paul Claudel, Jean Cocteau, François Mauriac, Raymond Roussel, Claude Roy, Antoine Saint-Exupéry, and Jean-Paul Sartre, while scientists and explorers who acknowledged Verne's inspiration have included Richard E. Byrd, Yuri Gagarin, Simon Lake, Hubert Lyautey, Guglielmo Marconi, Fridtjof Nansen, and Wernher von Braun. Ray Bradbury summed up Verne's influence on literature and science the world over by saying: "We are all, in one way or another, the children of Jules Verne." 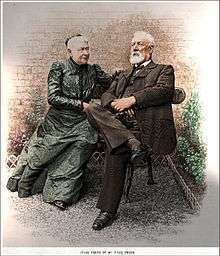 ↑ Jules-Verne 1976, p. 1: "On his mother's side, Verne is known to be descended from one 'N. Allott, Scotsman', who came to France to serve in the Scots Guards of Louis XI and rose to earn a title (in 1462). He built his castle, complete with dovecote or fuye (a privilege in the royal gift), near Loudun in Anjou and took the noble name of Allotte de la Fuye." ↑ "Verne". Random House Webster's Unabridged Dictionary. ↑ Angenot 1973, p. 34. 1 2 Evans 2000, p. 33. ↑ Butcher 2006, pp. 5–6. 1 2 3 Butcher 2007. ↑ Jules-Verne 1976, p. 3. ↑ Allotte de la Fuÿe 1956, p. 20. 1 2 Lottmann 1996, p. 9. 1 2 Terres d'écrivains 2003. 1 2 Verne 1890, §2. ↑ Compère 1997b, p. 35. ↑ Allotte de la Fuÿe 1956, p. 26. ↑ Pérez, de Vries & Margot 2008, C9. 1 2 Lottmann 1996, p. 17. ↑ Compère 1997a, p. 20. ↑ Lottmann 1996, p. 19. ↑ Jules-Verne 1976, p. 10. 1 2 Lottmann 1996, p. 14. ↑ Compère 1997c, p. 41. ↑ Lottmann 1996, pp. 14–15. 1 2 Lottmann 1996, p. 24. ↑ Lottmann 1996, p. 16. ↑ Compère 1997c, p. 42. ↑ Jules-Verne 1976, p. 12. ↑ Jules-Verne 1976, p. 17. 1 2 Sherard 1894, §3. ↑ Lottmann 1996, p. 32. 1 2 3 Lottmann 1996, p. 25. ↑ Dumas 1988, p. 372: "Je suis bien Allotte sous le rapport de l'estomac." ↑ Dumas 2000, p. 51: "La paralysie faciale de Jules Verne n'est pas psychosomatique, mais due seulement à une inflammation de l'oreille moyenne dont l'œdème comprime le nerf facial correspondant. Le médiocre chauffage du logement de l'étudiant entraîne la fréquence de ses refroidissements. L'explication de cette infirmité reste ignorée de l'écrivain ; il vit dans la permanente inquiétude d'un dérèglement nerveux, aboutissant à la folie." 1 2 Lottmann 1996, p. 29. 1 2 Evans 1988, p. 17. ↑ Dekiss & Dehs 1999, p. 29. 1 2 Lottmann 1996, p. 37. 1 2 Evans 1988, p. 18. ↑ Lottmann 1996, pp. 53, 58. ↑ Jules-Verne 1976, p. 27. ↑ Lottmann 1996, p. 38. ↑ Lottmann 1996, pp. 46–47. ↑ Lottmann 1996, p. 47. ↑ Dekiss & Dehs 1999, pp. 30–31. ↑ Lottmann 1996, pp. 39–40. ↑ Margot 2005, p. 151. ↑ Lottmann 1996, p. 57. 1 2 Lottmann 1996, p. 58. 1 2 3 4 5 Evans 1988, p. 19. ↑ Evans 1988, pp. 18–19. ↑ Jules-Verne 1976, p. 37. ↑ Jules-Verne 1976, pp. 40–41. ↑ Lottmann 1996, pp. 66–67. ↑ Jules-Verne 1976, pp. 42–43. ↑ Jules-Verne 1976, p. 44. 1 2 Lottmann 1996, pp. 76–78. ↑ Lottmann 1996, p. 79. ↑ Lottmann 1996, p. 81;confusion regarding the year resolved with reference to Jules-Verne 1976, p. 54, Butcher 2007, and Pérez, de Vries & Margot 2008, B6. ↑ Jules-Verne 1976, p. 54. ↑ Jules-Verne 1976, pp. 54–55. ↑ Evans 1988, pp. 23–24. ↑ Jules-Verne 1976, p. 56. ↑ Jules-Verne 1976, pp. 56–57. ↑ Evans 1988, pp. 29–30. 1 2 3 Sherard 1894, §4. ↑ Evans 1988, p. 30. ↑ Evans 2001, pp. 98–99. ↑ Lottmann 1996, pp. 101–103. ↑ Evans 1995, p. 44. ↑ Evans 2001, pp. 100–101. ↑ Jules-Verne 1976, p. 9: "After about 1870, Verne was less and less subservient to the discipline of the Church: his wife went to Mass without him and his views broadened into a kind of Christian-based deism." ↑ Costello 1978, p. 34. ↑ Verne 2007, p. 412. ↑ Oliver 2012, p. 22. ↑ Dehs, Margot & Har'El 2007, X. ↑ Evans 2000, pp. 11–12. ↑ Evans 2000, pp. 12–13. 1 2 Evans 2000, p. 14. ↑ Evans 2000, p. 15. ↑ Evans 2000, pp. 22–23. ↑ Evans 2000, p. 23. ↑ Evans 2000, pp. 24–6. ↑ Angenot 1976, p. 46. ↑ Evans 2000, p. 29. ↑ Angenot 1973, pp. 35–36. ↑ Evans 2000, pp. 29–30. ↑ Evans 2000, pp. 32–33. ↑ Evans 2000, p. 34. ↑ Evans 2005b, p. 117. ↑ Evans 2005b, p. 105. 1 2 Evans 2005a, p. 80. ↑ Evans 2005a, p. 117. ↑ Evans 1988, p. 1. ↑ Evans 1988, p. 2. ↑ Evans 2000, p. 24.